Mike Colvin and Mary Ferguson have been breeding registered Angus cattle since 1969. Both grew up in Ohio and were involved in 4-H and the National Junior Angus Association as youngsters. 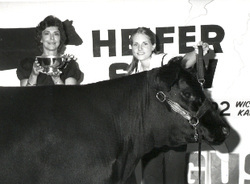 They each successfully showed their junior project cattle throughout the 1970's and early 1980's, and Mary won the National Junior Angus Showmanship Contest in 1980. In the fall of 1979, Mike began attending Ohio State University, and Mary moved to Manhattan, Kansas, where she attended Kansas State University. Both majored in animal science. Mary went on to obtain a masters degree in animal production, with an emphasis on beef cattle reproduction. After leaving Ohio State, Mike returned to his family's farm, Colvin Angus Farms, in West Salem, Ohio, and managed the Angus cow herd and farming operation, which consisted mainly of corn and soybeans as cash crops. While there, Mike began breeding performance Angus cattle and built a cow herd focusing mainly on bloodlines including "Traveler" and "Bando" - two great patriarchs of the Angus breed. Mike also served on the local farmers' cooperative board of directors. While at K-State, Mary participated on the university's livestock and meats judging teams. She also worked at the KSU purebred beef barn and meat science laboratory, where she served as assistant manager, as well as serving as an extension assistant while she attended graduate school. Upon graduation, Mary returned to Ohio to accept employment with the American Angus Association's Certified Angus Beef Program, where she was most recently employed as associate executive director for the highly successful branded beef marketing program. Mike and Mary were married on April 15, 1993, and immediately began searching for a ranch in the Kansas-Nebraska region. 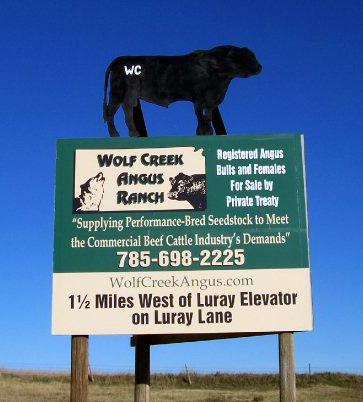 In the early spring of 1994, they were able to purchase 53 females from the cow herd Mike had developed at Colvin Angus Farms, and they moved to Luray, Kansas, to begin building Wolf Creek Angus Ranch. weAdded to the Wolf Creek cow herd were six "Power Play" females Mary selected from her family's operation, Calcutta Farms, in East Liverpool, Ohio. Also added to the herd in 1994 were twenty females purchased from Lyons Ranch, Manhattan, Kansas. 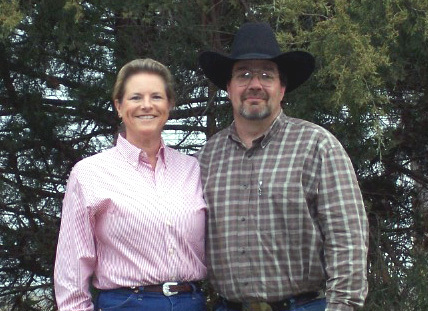 Jan and Frank Lyons, Mary's sister and brother-in-law, provided Mike and Mary the opportunity to select several "Traveler" and "Bando" bred females to expand the performance-bred base cow herd of Wolf Creek Angus Ranch. The Wolf Creek Angus Ranch cow herd is a spring calving herd. Today, brood cows number over 200. Each spring, breeding age females are artificially inseminated once prior to being turned with a natural service sire for the remainder of the breeding season. The majority of the heifers produced at the ranch are grown and developed, with a small number sold annually as weanlings in the fall, yearlings in the spring, or as bred heifers in fall. The balance are retained in the herd as replacements. Nearly all of the ranch's cattle income is generated from private treaty sales, with a select group of 75-85 bulls offered each spring. Wolf Creek Angus Ranch includes approximately 1,260 acres of deeded native pasture, with an additional 1,000 acres of leased native grass, as well as 300 acres of brome and other grass hay and 125 acres of alfalfa hay, which is harvested in large round bales and used primarily as a cash crop.